Crystal Palace's former Cardiff star Joe Ledley hopes both clubs can avoid relegation no matter what the outcome of their Premier League meeting on Saturday at Cardiff City Stadium. Ledley makes his first competitive club return to the Welsh capital following his 2010 move to Celtic. 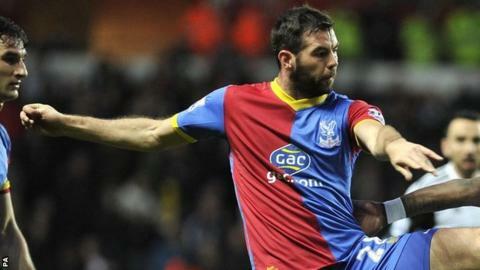 Ledley, 27, joined Palace in January, 2014 under Welshman Tony Pulis. "I'd love to see both of them stay up," said Ledley in an interview conducted soon after moving to Selhurst Park. "That would be a fantastic season for myself and for the clubs." Ledley, 27, made more than 250 appearances for the Bluebirds before moving to Scottish giants Celtic on a free transfer in 2010. The midfielder has made seven appearances for Crystal Palace since signing and helped them to a shock 1-0 win over title-chasing Chelsea last Saturday. On the same day Mats Moller Daehli's injury-time equaliser salvaged a point for Cardiff against West Bromwich Albion. That result left Ole Gunnar Solskjaer's side 18th in the table, three points from safety with just six games of the season remaining. The first of those six games is against Crystal Palace, who are in 16th position and five points ahead of the Bluebirds. "[I] don't want Palace to go down and obviously you don't want the club you support to go down as well," said Ledley. "I'd love to see both of them stay up - that would be a fantastic season for myself and for the clubs. "I went down [to Cardiff] this season to watch the game against Spurs and everyone was nice to me. "I keep in touch with some of the players and staff as well, so it's always been a great relationship with the club." Cardiff missed out on securing a transfer fee for Ledley when he moved to Celtic under the Bosman ruling, but he hopes for a good reception in Wales. "It's where I'm from and I had fantastic years at Cardiff," said the midfielder. "Every memory was a great memory. "Obviously I would have liked to have left on better terms, but for me and the club, it just didn't happen. "That's one thing I regret, but hopefully I'll get a good reception and they appreciate what I've done for the club. "Cardiff fans are fantastic, they follow you wherever - similar to when I was at Celtic. "Home and away, they're always there and they'll always support. "They bring out performances [from the players]." "And coming here to Palace, it's a fantastic atmosphere - for me it's one of the best in the Premier League."